22ft Natural Horsemanship Rope / Communication Training Line with Brass Swivel Clip. 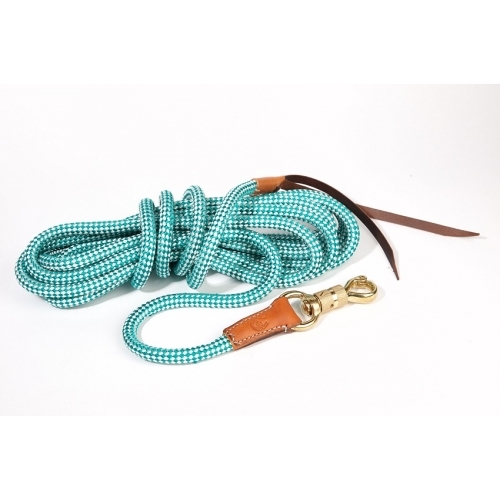 Parelli Style 6.7m / 22ft Communication Line is made from 1/2" Soft High Quality Rope with Ring and Brass Swivel Clip on One End and a Leather Popper the other. Slicing is Weighted to Provide Effective use of Phases. Smooth, Flexible and Resistant to Sweat. The Rope is Ideal for Natural Horsemanship / Parelli Training. Natural Horsemanship Ropes are easy to use, fabulous quality and excellent value for money! In natural horsemanship, it's very important to have a rope that conveys life and energy so you can communicate clearly through it. Natural Horsemanship Rope - Made from the Finest Quality Materials but Affordable!